The Hoover WindTunnel MAX Bagged Upright is amped up with many great features. WindTunnel MAX Technology offers 3 channels of suction that remove dirt with less scatter. Consumers can clean quickly and efficiently with up to 17-feet of above-the-floor cleaning reach, seven floor settings for every floor type, and a 15-inch wide nozzle that devours anything in its cleaning path. The WindTunnel MAX Bagged Upright takes cleaning to the MAX! Event though this is a "bag" sweeper. It works great! This is a nice Vaccum, except I find it a little difficult to replace the bag. Great suction..
An exceptional vacuum in this price range. Light, full size, with easy to use tools and a nice flexible hose. Switching from floor to tools is so easy! The extension tunnel for the hose extends far enough for me to reach the corners of the ceiling. Perfect. It gets up the pet hair and dust bunnies on carpet and hard floors without spitting dirt back at you. IMHO, bagged is better for pet owners. They last much longer and don't get clogged so easily. This Hoover is SO much better than the Eureka bag less it replaced. Suction is very good on both carpet and floor. The bag is easy to change and not messy and dusty like the bag lass vacuums. It doesn't require much effort to push. I do wish the hose was a bit more "stretchy" like the Hoover I had 6 years ago. The vacuum is well constructed and nothing has fallen off or broke in 6 months of use like the Eureka. I like the way the telescoping extension and crevice tool, store on the vacuum. Overall I'd say this one is a keeper. A great value on a great machine. I tried the bagless, wind tunnel vacuums and found that I didn't like them at all. Yes, I saved a small amount of money not having to buy bags but what I found was that the dust and dirt accumulated around the lid of the canister and I had to scrape it out with a knife. Because we have a lot of dog hair on our carpet, those oils caused the dust to get damp and clumpy. The bags are much easier and the machine stays clean. This machine has good suction for the pet hair and is very light weight. I grew up with the Hoover name. This vacuum doesn't disappoint. I had the bagless WindTunnel vacuum for several years and altho it did a great job, butterfingers me had a difficult time emptying it! Guess I am just old fashioned and prefer bags. Very happy with this vacuum. Has great suction, easy to change bag, long cord, and easy to manover. Speaking of, self propell, goes! Must hang on. I have dogs, great on furniture and floors. I loved bagged vacuums, and this one does the trick. It has great suction, and the cord is very long! Not too heavy to use on the stairs. Perfect! This is one of the best vacuum cleaners I've ever had. I have purchased many brands but this is really worth the money. I have pets and this cleans very well. Absolutely love this vacumn. The price was reasonable and it was exactly what I wanted. It works wonderfully and comes with attachments for stairs and or furniture. It was easy to assemble.. 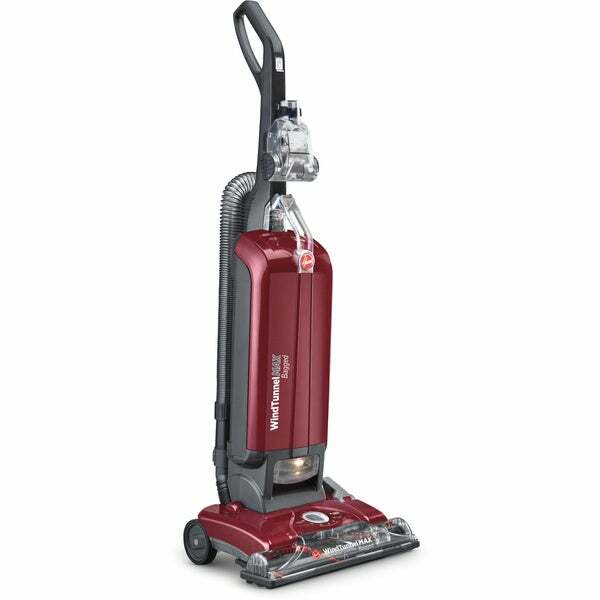 I saw this on Consumer Reports it said it was one of the best vacuums for the money. It was easy to put together. At first the brush wasn’t going around but I had to move something on the bottom of the front piece. My one complaint is it is very heavy, other than that it’s fine. This vacuum was the 4th replacement in a year at my retail store. It is used everyday. I had NO expectations for this little guy, but here we are months later and it is still WORKING!! Excellent! Would recomend. I bought this to deal with cat hair, and it does a decent job. I did end up buying a Pet hair vacuum as well, just for the attachments. But this is my daily vacuum and nothing gives me more pleasure, than watching my husband use it. I wanted a bagged vacuum. I do not like the bag less versions and, I have always truly liked Hoover. Personally I miss my 1970's version but, this is still a good product. "how well does it pick up pet hair; will it clean bare floors? Jerry, Timonium. MD"
It does a good job and works quite well on bare floors. It is because of pet hair that I chose this vacuum. In my experience, all vacuums, despite the cost, lose suction power in a couple of years. Pet hair kills the cheap and the expensive alike. That's why I stick with these Hoovers. They are excellent when new and replacing them is more affordable than getting those expensive ones repaired. Also, clearing the tube when it gets clogged has to be easy to do or I hate the vacuum. This one is easy. "Where does the hose come off for use with attachments? Most new ones with bags the hose has to be pulled from the base. The one I have now is easily accessed from the back." The hose is attached at the base in the back but more to one side. "What type bags does this vacuum require?" This uses Type Y Allergen Filtration Bags. "What is the battery for when it has a 30 ft cord?" Hello Kimberly C., we do apologize for the confusion, this item does not feature a charger and 18-volt battery. Thank you for shopping with us. This model was recommended by consumer's reports and we love the Hoover WindTunnel we've had for over 15 years and needed to finally replace. History with Hoover .Gift, needed bagged cleaner. "Is the base turbo powered so it is easy for my elderly mother to use?" Hello meyering, today turbo would refer to the air powered hand tool. The base of the cleaner is wind tunnel technology. Three channels which are front, rear and top of the agitator. This creates instant pick up of dirt off of a carpet. Thank you for shopping with us! "What is the charger for? Does the rolling brush stop for hardwood floors? Thanks"
Hello tehya, the charger is for the 18-volt battery. this will work on both carpeted and hard wood floors. Thank you for shopping with us!